300Kg-3000KgPP/P/PVC/PET Waste Barrels And Bottles Recycling Cleaning Production Line. PET mineral water bottles, cola bottle full automatic crushing washing dewatering and drying production line is the ideal equipment to waste mineral water bottle, cola bottle, PET bottle sorting, label removing, crushing, washing, dewatering and drying machine. This machine through a trial research by R&D to develop this new generation high efficiency, water-saving equipment. The quality of flakes used our equipment is similar to the new material can connect POY filament, staple, bottle perform, PET packing belt, sheet material directly etc. The equipment can wash PP, PE, ABS, PVC sink plastic too. The whole production line has a high-degree automation, only need 3-5 operators ,the capacity is: 300kg/h, 500kg/h, 1000kg/h, 2000kg/h, 3000kg/h, the water rate of flakes after cleaning is under 1%. It can save large energy, and guarantee the quality of the flakes at the same time. The production line includes: belt conveyor, label remover, sorting table, crusher, hot water steamer, screw feeder, high-speed friction washing machine, single/double screw washing machine, centrifugal dehydrator, cyclone hopper and electric cabinet etc. The features of this machine: beautiful appearance, low consumption, high capacity and practical and reliable. New rinse device can break with washing, improve the production efficiency and cleaning the materials to achieve the first grade requirements. 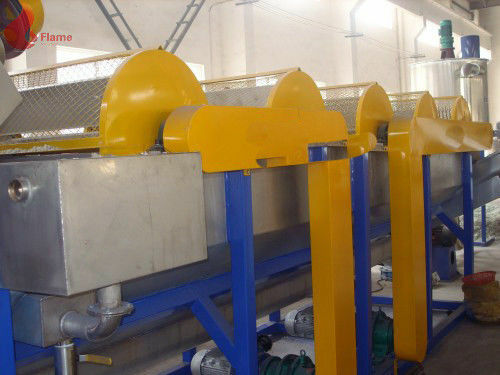 Bottles Recycling Cleaning Production Line uses the features of plastic and water to make bottle sink in the bottom. The following steps are taking off the friction, crushing, washing decontamination and dehydration.